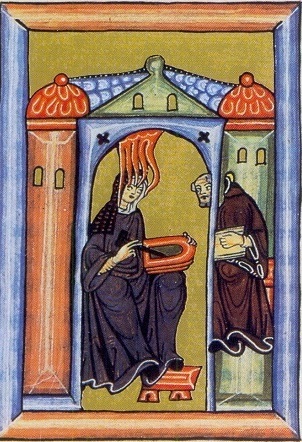 Hildegard von Bingen receives her divine visions and writes them with wax tablet and stylus while the monk Volmar inscribes her visions on vellum. Recently I found myself with a group of pilgrims in the Land of Hildegard von Bingen (1098-1179), near the Middle Rheine in Germany. Most of travelers were transpersonal and/or Jungian psychologists who had traveled all the way from South Korea in search of the wisdom of this saint, prophet, poet, dramatist, physician, abbess, preacher and Doctor of the Roman Catholic Church. A visionary in every sense of the word, Hildegard is perhaps best known for the hymns and canticles that she specifically wrote for the nuns of her own convent. As a child, Hildegard saw and heard visions, but it wasn’t until she was “42 years and seven months old” that she received a disturbing vision from God commanding her to, “Write what you see and hear,” in order to spread news of God’s words and ways. Thus she began work on her first book, Scivias (Know the Ways). Written over a period of ten years, the book describes a total of 26 visions on the subjects of creation, redemption, and sanctification. It would take a lifetime of scholarly pursuit to fully explore and come to some understanding of Hildegard’s theology. Nevertheless, I am going to boldly describe one of my first impressions, from a psychosynthesis point of view. What particularly struck me was the remarkable similarity between her third vision, called “God, Cosmos, and Humanity,” described in the first part of Scivias, and Assagioli’s model of the human personality. Perhaps, you also will intuitively recognize some similarities, but here are just a few that appeared before me. This entry was posted in Spirituality, The Higher Self and tagged Assagioli, cosmic egg, egg diagram, higher self, Hildegard of Bingen, psychoysynthesis, spirituality on September 7, 2015 by Catherine Ann Lombard.